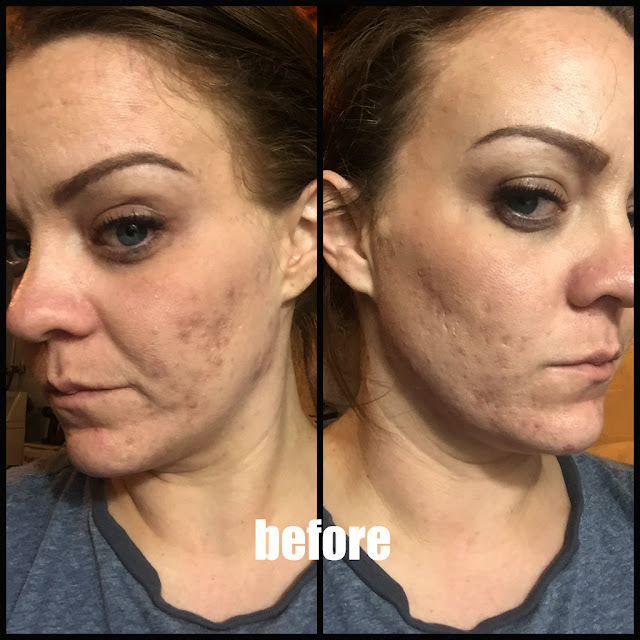 This is the final product that I am testing for my free goodies from my 2012 Holiday VoxBox from Influenster! 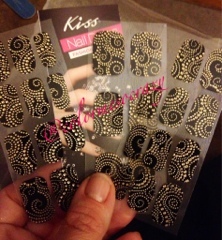 These are the nail dress strips from Kiss. I have tried several other brands of nail strips and I like to use them for a quick cute mani. I looooooved the color that I got. I could not find a name, but the number is KDS15. I applied them on both my toes and fingers. There are not any pictures of the toe strips because I hate feet, but I was able to use most of the leftover strip from my fingers for my toes. In the directions, they say to use the "square" side of the strip for toes. I like that and I have not seen that in the other strips I have used before. So for the application... All you do is measure, peel and stick. One thing I really like about this product is that they come about 10 strips on a clear sheet. This really helped with the measuring because I could just hold it up to my fingers to see if they line up. I have really small fingers and nails and they were so easy to fit. The only complaint I have is that they were difficult to "trim" the excess. Using nail scissors is what I had to do. With other brands, you can press it around the tip of the nail and just rip. I think since there were jewels on it is what made it more difficult. I have had them on for a full day- which by now with regular polish I would have at least 1 chip. I am really going to try to keep these on as long as possible so I will update you all with how long they actually last. Kiss claims 10 days. I have also gotten a lot of compliments on the design. If you check out their website here, you can see the other colors they have! Another really cool thing is that they give you design tips on the inside panel of the directions. They suggest you cut the strips to make designs on your nails. So French tips, stripes, diagonals, etc. Fun! I never thought about that! Well I highly recommend this is if you like to keep your manis on for more than 2 days. They are pretty, reasonably priced, and easy to apply. Enjoy!! 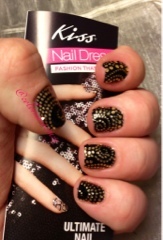 ntroducing Kiss® Nail Dress™, ultimate nail fashion for tips and toes! Just peel, apply, and shape for a manicure that lasts up to a week. On in minutes, off in seconds without remover. 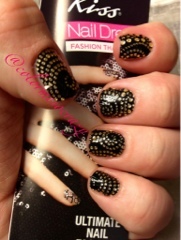 Nail Dress is available in 21 different styles, many of them featuring 3-dimensional jeweled designs. Check out Peplum, a deep silver with multi-colored gems for a pop of color, or Babydoll, for a golden and glamorous jeweled look. Skip the topcoat, Nail Dress has it built in. 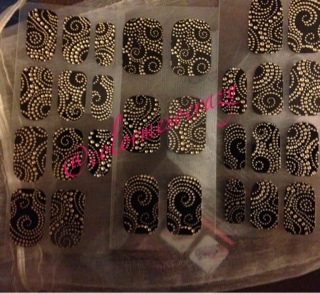 With 28 strips in each package, you can cut up your extras to create designs that can be used on top of polished or artificial nails. Add some pizzazz and use with imPRESS® Press-On Manicure™ by Broadway Nails for the ultimate DIY manicure. Nail Dress doesn’t dry out the way other polish strips can, so you can save them to use on your next mani. A nail design booklet is included in each package, just in case you need a little inspiration. Kiss Nail Dress’ suggested retail is $6.99 and is available in all major drug chains and mass retailers like WalMart, CVS and Walgreens. Visit KissNailDress.com to learn more!